When you’re standing in your own kitchen with a knife or spatula in hand, preparing and cooking your own foods, it can be easier to make healthy choices, especially if you started with a healthy cart at the grocery store. You can plan for breakfast, lunch, or dinner with raw ingredients and a recipe in mind. But let’s face it: every meal that we eat may not be in our own space. Whether it’s for work, social fun, traveling, busy schedules, or when the “I don’t feel like cooking” moments strike us, eventually we find ourselves in front of a menu. 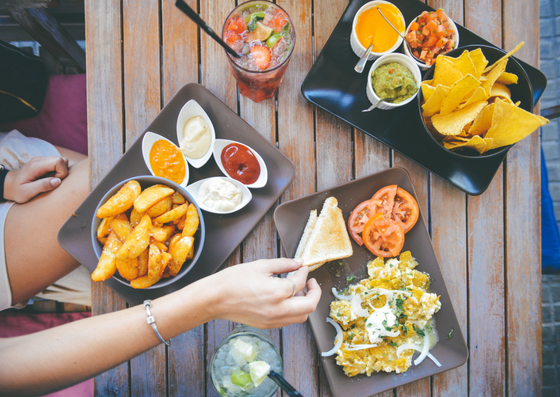 Dining out can seem intimidating when we are trying to eat more wholesome meals, because ingredients may seem like they’re not in our control and temptations are plentiful. Focus on your main meal. Look over the menu, find what you really want and get excited about your entree. In doing this, practice avoiding entree-sized appetizers, the bread bowl, and any beverages that may be loaded with sugar. Why waste your appetite on something you glanced over quickly or didn’t even order yourself? We’ve all fallen victim to getting filled up on heavy appetizers, or filling drinks, that we aren’t even hungry by the time our main dish comes out. Save your appetite for your main dish, and be sure to savor each bite! Don’t forget the vegetables. Aim to fill 1/2 of your plate with non-starchy vegetables. We’re used to seeing the common side dishes of potatoes, mashed or french-fried, or a steaming hot corn on the cob. Instead of these starchy vegetables taking up a big portion of your plate, focus on leafy greens and vegetables higher in fiber. Some examples of these vegetables are zucchini, yellow squash, broccoli, peppers, cauliflower, onions, lettuce, cucumbers, mushrooms, Brussels sprouts and asparagus. Most places allow you to swap out fries and chips for side salads, fruit, or a seasonal non starchy vegetable side. Ask about vegetables sides from your server or go with a main dish that is already prepared with vegetables. Balance your plate. In addition to the starchy vegetable options of corn, peas, beans, and potatoes, restaurants are also notorious for overflowing our plates with other starches like rice, pasta, and bread.Although these foods can be part of a balance diet, they should only take up about 1/4 of our plate. Just get creative! This means that while a burger and fries puts most of us over our starch quota, we can still enjoy our favorite elements of this meal by choosing a “naked” burger with fries or a regular burger with veggies or a side salad. And just in case you don’t feel like learning these tips and applying them on your own, we have made it even easier for you by creating restaurant guides for your area!